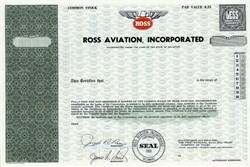 Beautiful RARE specimen certificate from the Ross Aviation, Incorporated made in 1970. This historic document was printed by the Federated Banknote Company and has an ornate border around it with a vignette of the company logo. This item has the printed signatures of the Company’s President, Joseph R. Ross and Secretary, and is over 40 years old. Ross Aviation, Incorporated was a publicly held company engaged in performing contracts for military and governmental agencies, trained Army pilots at Fort Rucker, Alabama, under contract with the Army beginning in 1962. An American aviation magnate awaiting extradition to the United States on tax fraud charges has skipped bail and disappeared. Joseph Ross, also known as Gilberto ``Jay'' Picon, is believed to have fled the country, officials said Friday. His wife, Pamella Picon, the former Belizean consul to Canada, also is thought to have left Canada. The 73-year-old Ross was indicted on tax fraud charges in the United States in 1986 for allegedly failing to report and pay taxes on $500,000 held in foreign bank accounts. Canadian police arrested him on Dec. 20 in Vancouver, and he faced extradition to the United States. Ross is the founder of Ross Aviation, an aircraft and training company in Tulsa, Okla., that is still in business. The firm made much of its money on U.S. government contracts to train helicopter pilots in Vietnam.